On my last day in the Rockies, we ventured up to Lake Louise and Moraine Lake for some sightseeing. We were heading to Peyto Lake when Torben graciously agreed to take the road that promised the possibility of seeing wildlife. I was encouraged not to get my hopes up, but I really wanted to see a bear. We hadn’t been driving long, before we noticed a few cars stopped on the side of the road. Sarah and I immediately jumped to the biggest conclusion, but Torben thought it was probably just an elk. 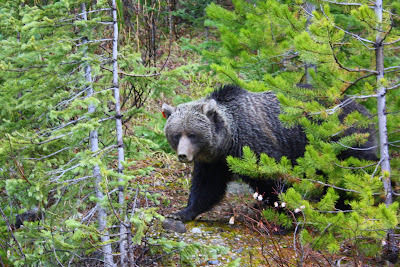 As we got closer, Sarah and I squealed with excitement as we both spotted the beautiful brown grizzly bear walking alongside the road in the ditch. As Torben pulled the car over, I was jumping out of my seatbelt, sliding to the opposite side of the car and gearing up my camera. I rolled down the window, poked my head out to see him, and thought for a moment how much better I could see him if I stood just right outside the car. I decided, however, that seeing Mr. Grizzly from inside the car would have to be enough. There was a slight sprinkle outside, so I did my best to keep my camera from the rain. 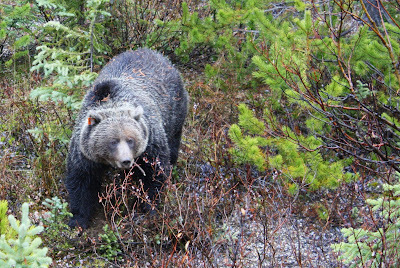 I snapped one picture after another as the bear slowly made his way closer to our car, digging for berries along the way. One gentleman got out of his car and stood right next to ours. Do you know what you call a man who stands twenty feet from a bear voluntarily? I know the man was exercising poor judgement, but I seriously wanted to be stupid with him. The bear was so docile and seemed completely unaffected by all the cars and cameras, which could definitely give one a false sense of security. I knew things with this bear could change on a dime, so the poor man stood alone wearing his stupid sticker, while I got all my shots from the car. There was this teeny-tiny part of me that hoped the bear would get angry and charge the “stupid” man so I could get some killer action shots. After all, my photography class was meeting the next week to show off our favorite pics. I could get a picture of a real, live, charging bear! Who’s gonna top that? That’s right. Nobody! Of course, the very biggest part of me said a quick little prayer for the “stupid” man and his safety. After the man got his award-winning shots that could have only been captured standing outside a vehicle, in harm’s way, he made it to his own car, safe and sound. I – the non-stupid tourist from Ohio – left the scene with 23 blurry shots of what looks like a bear – because I’m an amateur photographer and every part of my brain that held pertinent information on how to take a great picture went suddenly dormant and I set the camera on the worst possible settings for this occasion. Luckily, the bear hung around long enough for me to correct my mistake and I got some decent shots of Mr. Grizzly, as you can see above. 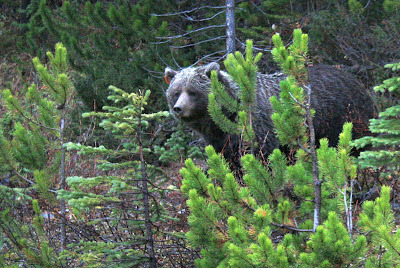 We were fortunate enough to spent twenty blissful minutes with the beautiful bear before he finally disappeared into the evergreens. As we reluctantly drove away, we were still buzzing with excitement. Everybody in the car agreed that we were totally blessed to have had this experience. Of course, we were barely three miles down the road when Sarah said, “Wow. Sure would be cool to see two bears today”……..